Reagor had three sacks, Freeney, Brock and Mathis one each. Peyton Manning was uncharacteristically off target and out of sorts against Jacksonville's coverage. Manning wasn't sacked but frequently was pressured and forced out of the pocket. He finished 13-of-28 for 122 yards with one interception and a quarterback rating of 44.0 - his worst regular-season rating since December 2001. The Jaguars got the Colts out of sync from the get-go, using a 3-3-5 defensive alignment that crowded the passing lanes, coupled with an aggressive effort from the corners to press their receivers. It was a blueprint from the New England Patriots, and it left Manning wondering if some of the Patriots had slithered into Jacksonville uniforms. With the Jaguars playing three down linemen and dropping eight defenders into coverage, they practically begged the Colts to run. They were saying, "If you want to beat us, you better run it," guard Jake Scott said. "And we did." The Jags might have played well against the passing game, not so well against The Edge. James had 128 yards rushing, and caught four passes for 39 yards. "You have to be realistic," Manning said. "They've got more guys than we can throw against in that look." 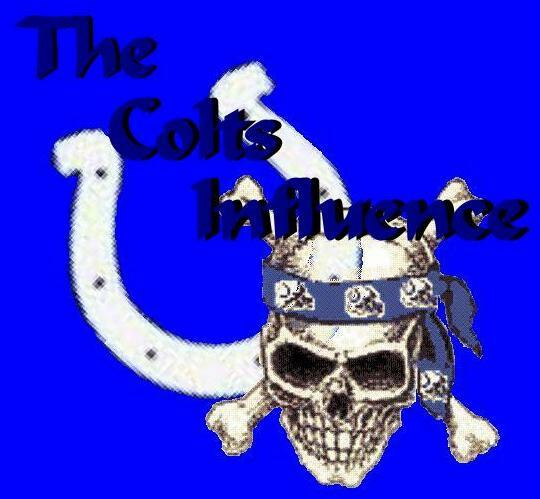 The Colts ran the ball 38 times and passed it 28. Edgerrin James rushed for 128 yards - his first 100-yard effort in eight games against the Jaguars. 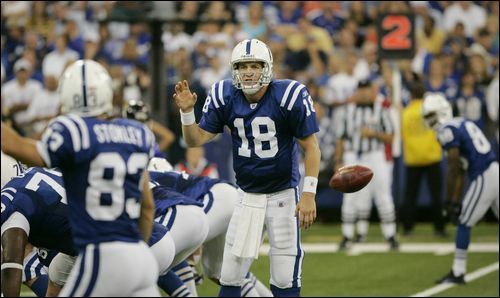 Colts QB Peyton Manning (18) looks to receiver Brandon Stokley as a diversion during a direct snap to Edgerrin James in the fourth quarter. The trick play gained five yards and help set up the Colts only touchdown on the day. Manning checked out of a pass to a run when Jacksonville showed heavy pass coverage on third-and-goal at the 6. 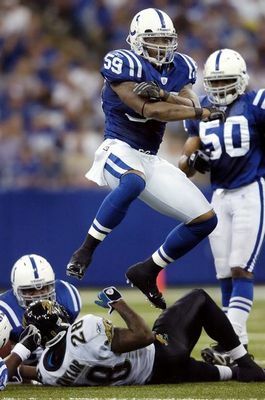 Colts linebacker Cato June (59) celebrates after stopping Jaguars running back Fred Taylor in the second quarter. Taylor rushed for 81 yards but couldn't get into the end zone. Indianapolis Colts cornerback Marlin Jackson, left, breaks up a pass intended for Jacksonville Jaguars wide receiver Jimmy Smith in the third quarter. Over an 11-minute span of the second quarter in his Jaguars' loss to the Colts on Sunday, the rookie Chad Owens fumbled two punts, and bobbled another, before being "benched". Jacksonville's Chad Owens reaches back through his legs to gather up a dropped punt return catch as Colts defensive back Gerome Sapp tries to capitalize on the loose ball in the second quarter. 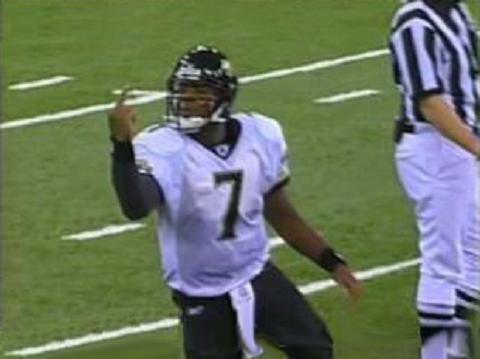 Colts' Defense makes life miserable for Jags QB Byron Leftwich during Sunday's game. The Colts front four, sparked by Dwight Freeney continues to leave its imprint. The latest exhibit: Byron Leftwich's body. The Colts bruised and abused the Jacksonville Jaguars quarterback, sacking him six times and forcing three fumbles in a gritty game of football which soaks in violence on aweekly basis, however, this was a particularly bloodied contest, even by NFL standards. Helmets flew, jaws were rattled, and knees were shattered. Leftwich required help getting off the field after he was hit by all four Colts linemen on a fourth-quarter sack by Brock. There was concern about Leftwich's left knee, but he denied that the knee was involved and refused to elaborate on the nature or extent of his injury. The hardest shot he took came on a 24-yard completion to wide receiver Jimmy Smith. Freeney ran right through Leftwich on his follow-through. On the next play, the Jaguars quarterback spiked the ball to stop the clock. Then he bent deeply in pain while gathering himself. The Jaguars' best wasn't enough to keep Leftwich upright against the attacking Colts, who made life miserable for the Jacksonville offensive line. "It all starts with their guys up front,'' Leftwich said. "They don't allow you to attack the areas you want to attack because they get to you before you can get down the field. They're good at what they do." Colts fans from The RCA Dome noise made it difficult for Jacksonville quarterback Byron Leftwich to communicate with his team Sunday against The Colts. However, he had no such difficulty sending a message to Indianapolis Colts defensive line coach John Teerlinck. Leftwich picked himself up after a third-quarter incompletion and turned his ire toward Teerlinck on the Colts' sideline. Leftwich shouted a thing or two, and then raised his middle finger in obscene salute. Leftwich then did it again, as if for emphasis. Byron Leftwich in an interview after the game claimed, "I'll keep that between us. He started it, though. I'll keep it between us. He wouldn't want that out. He said something, and I didn't agree with him," Leftwich said with a laugh. "He told me I was a pretty good quarterback and great job and get up. I'll just leave it at that." You may think your good enough to flip us. However, you're just not good enough to whip us. 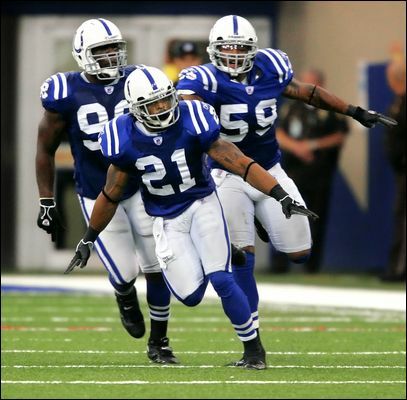 Colts defensive back Bob Sanders (21) flies back towards the bench in celebration along with teammates (L to R) Robert Mathis and Cato June after Sanders knocked down the last touchdown play in the endzone giving the Colts a victory in Sunday's game against the Jacksonville Jaguars. 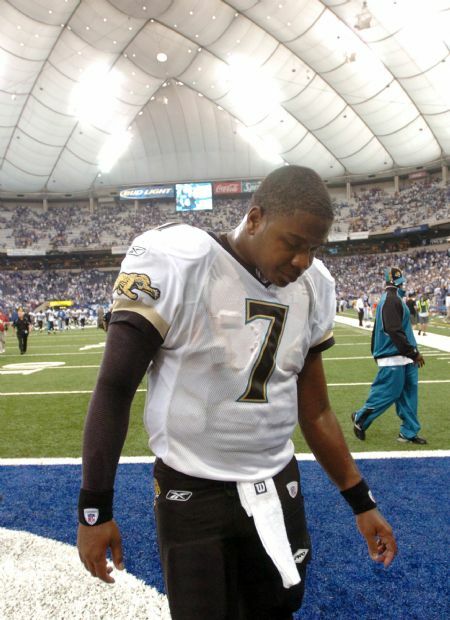 Jacksonville Jaguars quarterback #7 Byron Leftwich hangs his head as he limps off the field following the Jags 10-3 defeat to the Indianapolis Colts Sunday September 18, 2005 at the RCA Dome in Indianapolis, Indiana. 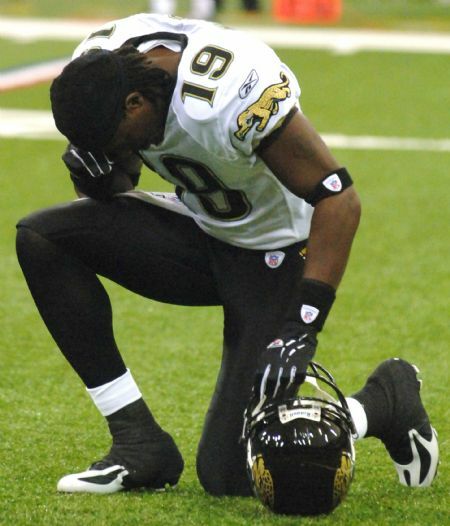 Jacksonville Jaguars receiver #19 Ernest Wilford kneels on the field after the Jaguars final play with 3 seconds left in the game fell incomplete giving the Indianapolis Colts a 10-3 victory Sunday September 18, 2005 at the RCA Dome in Indianapolis, Indiana. Indianapolis took the early edge in the AFC South title chase - protecting its home field against the only team to beat it at home last year - and got more help when Carolina beat two-time defending Super Bowl champion New England. That result brought a roar from the stragglers still left inside the dome. Sunday's game marked the first time in James' career that he rushed for 100 yards against the Jaguars. ... Harrison's three catches gave him 854 in his career, breaking a tie for sixth all-time with Irving Fryer, who had 851. 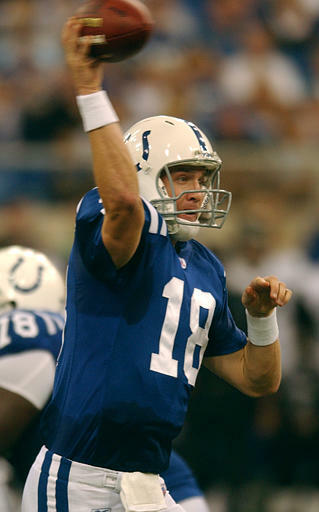 Just imagine what the Colts will be like when Peyton starts to click!